McDonald's always have something special for kids and kid-at-heart out there. They recently announces that on June 15-20, you can now pre-order the complete Minions Happy Meal set in all McDonald’s store nationwide. Yes you heard it right, the small, yellow, lovable goggled creatures are back—and they are out to take over the world once again! 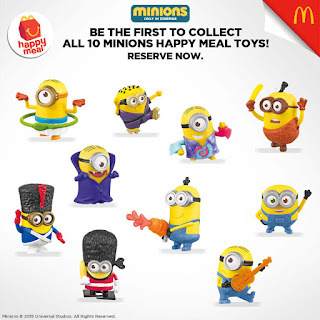 With "Minions" movie soon to be release in cinemas, McDonald's wants to treat you first everyday in every order of Happy Meal. Just follow these simple steps, so that can complete your Minions Happy Meal set before others even start collecting! Watch out for more exciting surprises that McDonald’s has in store for certified Minions fanatics! For more information, visit happymeal.com.ph, like the official Facebook fan page at www.facebook.com/mcdo.ph, or follow @McDo_PH on Twitter and Instagram. #MinionsAtMcDo.